Cinnamon oil is an ingredient found in some chewing deterrent products which help keep pets from destructively chewing household objects, and from chewing, licking and scratching wounds and bandages. Cinnamon oil chew deterrents come in aerosol sprays, and in bulk liquid containers. 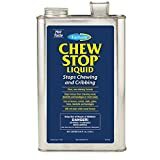 Cinnamon stop-chewing products are especially popular for horses, as they can be sprayed on paddock and pasture fences and on barn sidings.